We’ve all been there. You’ve spent hours curating a document, editing a video How to Edit Videos Like a Pro: 8 Tips You Need to Master How to Edit Videos Like a Pro: 8 Tips You Need to Master If you're just getting into the editing game, you may be confused as to what to do with the many millions of clips you have... well, we're here to help. Read More , or photoshopping an image, only to be told the file is too large to send as an attachment via email. Of course, if you want to share the file locally, you can easily load it onto a flash drive — but what about if you need to send it to a friend or colleague on the other side of the world? It used to be a nightmare scenario, and although web-based file transfer services How to Send Large Files as Email Attachments: 8 Solutions How to Send Large Files as Email Attachments: 8 Solutions Want to send large files via email but running into file size limits? We show you how to send large files via email attachments. Read More started to become popular in the tail-end of the last decade, they were still slow, cumbersome, and frequently failed. 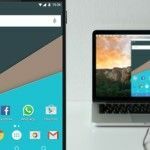 Thankfully, the advent of smartphones has helped streamline the process, and there are now a plethora of apps that let you share large files directly from your Android device. Here we look at the best options for you. Average file sizes are growing exponentially. Higher resolution photos, higher quality audio files, and the growing propensity to keep whole TV series and films on our hard drives means the cloud-based model of uploading, sharing, and downloading is starting to become dated. The Sunshine app does away with that model, meaning you don’t have to upload files to a server before you can send them. Instead, as soon as two people have to app installed on their device, the content in question can be downloaded or streamed almost instantaneously. A 10GB file will send in less than ten seconds. Perhaps most importantly, the app isn’t just limited to Android. It also has releases available for iOS, Windows, and Mac. While that obviously means you can send files between multiple devices and OSes (who keeps on their data on one device? ), it also means you can browse the hard drives of those devices from your Android app — no more accidentally leaving a vital presentation on your office computer when you’re heading out for a meeting. The only really restriction we came across was that sent/received files were automatically removed from the app after seven days — but that shouldn’t impact most users. There is no maximum file size. Like Sunshine, Send Anywhere has also moved on from the cloud-based model. The main difference between the two apps is that while Sunshine requires you to create an account before you can use it, Send Anywhere only uses SSL security and a 6-digit key to pair two devices together. This has both advantages and disadvantages. 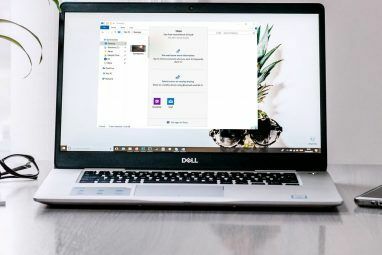 Although it speeds up the process at which files can be sent and adds a layer of anonymity to the process, it also means no more than two devices can be paired together at any one time, and you’ll have to disconnect from one paired device to connect to another. As with Sunshine, there are releases for multiple devices — but if you want to enjoy the ability to remotely manage every device that you’ve registered with Send Anywhere, you’ll still have to create an account and log in. Other useful features include the ability to pair devices together by using a QR code (similar to how the WhatsApp web app Use WhatsApp Web on Your PC: The Ultimate Guide Use WhatsApp Web on Your PC: The Ultimate Guide WhatsApp Web is a quick and easy way to use WhatsApp messages on your computer. We show you how to use WhatsApp Web on your PC. Read More works), and a way to share files by Bluetooth to avoid all forms of networking if the two devices are in close enough proximity. Shared files are only available for ten minutes by default, but that can be changed in the settings. No list of apps for sharing large files would be complete without WeTransfer. It’s been around since 2009 and has long-been one of the market leaders in the cloud-based sharing sector. As we mentioned earlier, cloud-based sharing may not have a future in the long-term, but right now it still has an important role to play. Although the process might be slower than the point-to-point offerings, WeTransfer has one huge advantage over the two apps we’ve already discussed — namely, that it does not require both the sender and the receiver to have the app installed. Instead, you can share a file with anyone as long as you know their email address. It’s easy to see how this could be expanded to social media sharing — but that’s not yet a feature. Unlike point-to-point sharing, the technology supporting the app means the developers have had to impose a maximum file size. In WeTransfer’s case, this is 10GB. A word of caution, if you’re using this app on 3G rather than WiFi, you could find that your upload speeds are a lot slower and that your data plan is eaten up extremely quickly — though it’s worth mentioning that uploads can be paused and restarted as you require. Android Beam offers a third method of transferring files: Near Field Communication (NFC) technology. NFC is possibly one of the most underused technologies Feel Like a Billionaire With the Latest Uses for Android NFC Technology Feel Like a Billionaire With the Latest Uses for Android NFC Technology Did you know Near Field Communication technology powers Bill Gates's techno-utopian Xanadu 2.0 mansion? Visitors to the Gates' estate receive a wearable NFC tag, which comes programmed with the visitors' climatic and aural preferences. Upon... Read More in mobile devices, despite its widespread adoption by manufacturers in the last couple of years. Android Beam has actually been included in every Android release since 4.0 and lets you share almost anything, be it a YouTube video, a link, a photo, or a file. Most phones will allow you to activate NFC within a menu setting, and if you’re running Android Lollipop, it’s also listed in the share menu. Once activated, it’s simply a case of selecting the file you want to share and putting your phone’s chip against another phone’s chip (be warned, it’s not always easy to find the chip, but they are typically located on the back and near the top). 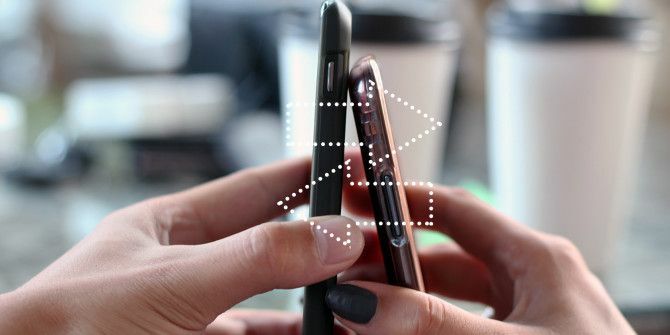 This method will not allow you to transfer files between Android devices and an iPhone; currently, Apple’s NFC technology only works with Apple Pay Everything You Need to Know about Apple Pay, Samsung Pay, and Android Pay Everything You Need to Know about Apple Pay, Samsung Pay, and Android Pay Android Pay, Samsung Pay, Apple Pay all have their advantages and disadvantages. Let's take a look at exactly how each of them works and who can use them. Read More , though there are rumours its functionality will soon be expanded. What are your thoughts about the apps we chose? What about the methods underpinning the apps? Would you rather use point-to-point technology, the cloud, or NFC to make the transfer? Perhaps you’ve used some of our choices, or you’ve got some other suggestions to add to the list? Whatever your thoughts, we’d love to hear from you. Let us know your feedback in the comments section below. Explore more about: File Management, File Sharing, NFC. I really like using MyAirBridge.com - I find it easy to use and very reliable. There is great options for everyone and I think it's much better deal than what you get on similar sites. I have a mobile which is window nokia lumia 520 . Recently i have had installed share it app but unfortunately it did not share it . can someone let me know which app is to be best for windows nokia lumia to share the movie , video etc. We have a new desktop app called Sharepad by Nivano. it works like wetransfer but is on the desktop, and has some cool added features such as contact syncing and adding screenshots. We have a mobile and web version coming out soon as well. Please check it out, any feedback would be greatly appreciated! I'm curious why Google drive wasn't a contender for the list. Seeing as you can share multiple gigs of data, real time edit, and customize privacy options, all from either computer or other personal devices. Was there a reason it wasn't included with these? Can't agree more on Gopi's point. Kindly categorize based on data transfer (network based online transfer) and wifi transfer (device based offline transfer). In the offline transfer type, on my Android smartphone, I use the app "Software Data Cable" (I find only the name a bit weird, but the app is great! ), which, IMO, is a self generating app... i.e. if one phone has the app installed, it can transfer itself (APK) via wifi to the other phone to install it... and then you can start file (and even folders) transferring... 1GB transferred in around 15mins. The app has option to transfer files to 1. PC (GNU/Lx / MSWin - based on FTP) and 2. also to a few cloud services. In the online transfer type, I have not ventured much, and still use the relatively simple Google Drive. Thanks Zaheer, will keep that in mind for the future. These are alright... but has anyone used SmartIO? Have had a few friends recommend it to me, but I'm a bit apprehensive. Don't want to download ANOTHER app just to transfer like two or three different content types. Need to transfer more stuff between platforms too. Ugh! Help...I need some expert opinion. No, I've never used it. Do let us know what it's like if you try it out. Thanks Vincenzo... Will keep it in mind when we revisit this topic. I am not always online so I use an offline WiFi transfer app like Xender. The problem with it is that it always works in the background even though I'm not using it so it consumes my RAM and battery; also, the other phone needs to install the app. That's why sometimes I just make my own wifi hotspot and transfer files using ES File Explorer, but of course the other should have it installed but at least it doesn't consume my battery juice afterwards. Two thumbs up for Infinit!!! Wow. A lot of people of voting for Infinit! That would be the fair comparison. Apps like Superbean, Xender, etc use NO internet. This differentiation is a must IMHO. Fair point Gopi. Should have considered that. I use SHAREit to transfer files but it only works if 2 devices are in range. Can you tell me the speed difference between SHAREit and Send Anywhere? Ditto Infinit.....the best out there. I have used it to send Price Lists and Catalogues to customers, and had no problems. Oh boy, if you don't include Infinit, you haven't seen anything yet. That app is literally the best I've tried in my entire designer life & it works through all devices (Win, Mac, IOS, Android). I blame myself for not getting to hear about it before, it's TOO fast! I also blame you for not telling me about it sooner...! Can't believe I had to scroll so far down to find a mention for infinit. By far the best app for sharing big files. Prior to that was FilePush, but Infinit blows it away because you can easily share between devices, and friends without an in between cloud upload slowing everything down. I just tried "JustBeamIt", sent a 37.06 MB file to a second computer just a foot away, it sent successfully, but it took about 7 minutes to send & receive. Not really fast IMHO. Interesting, thanks for the feedback Mick. Looks like we did well not to include it after all. Umm... JustBeamIt.com? No sign up, no installation, cross-platform, works across the internet without needing physical closeness? Pretty awesome little program. Personally I don't like Dropbox, it seems too limited. I believe it's good if you have a Mac though? 10 GB within secs really phone hardware support this I/O ?? Android Beam only uses NFC for pairing, then it transfers the file via Bluetooth, which isn't as fast as WiFi direct (SuperBeam). try Shareit by lenovo...it is similar to wifi direct.. I nearly included that actually. What makes it stand out from the others? my neigbour got a stunning Dodge Challenger Coupe by part-time working online from home..
What about SuperBeam? In my opinion it's the best. Yo can share files though WiFi direct, between devices in the same WiFi, it creates a WiFi hotspot for the filesharing in case the other device doesn't support WiFi Direct and the devices are not in the same WiFi network. It even creates a web server so that the person receiving the file doesn't need SuperBean installed. It can make the link through NFC, through a QR code or by hand. Thanks Joseba. I've never actually used SuperBeam. Is it faster than SendAnywhere and Sunshine? Nfc not only doesn't work on iPhone because it's only for Apple pay but also only the latest models have it, Apple never use Nfc in anything else other than the iPhone 6/6+.